This stunning picture of the Korean peninsula taken in late January by a member of the international space station crew says it all. The photograph can be downloaded in various resolutions from the NASA web site here. I've annotated the photo accompanying this post (click to see a full size version and read the annotations clearly) to show the national capital area (수도권 sudogwon) which surrounds Seoul and includes Incheon and Gyeonggi Province. 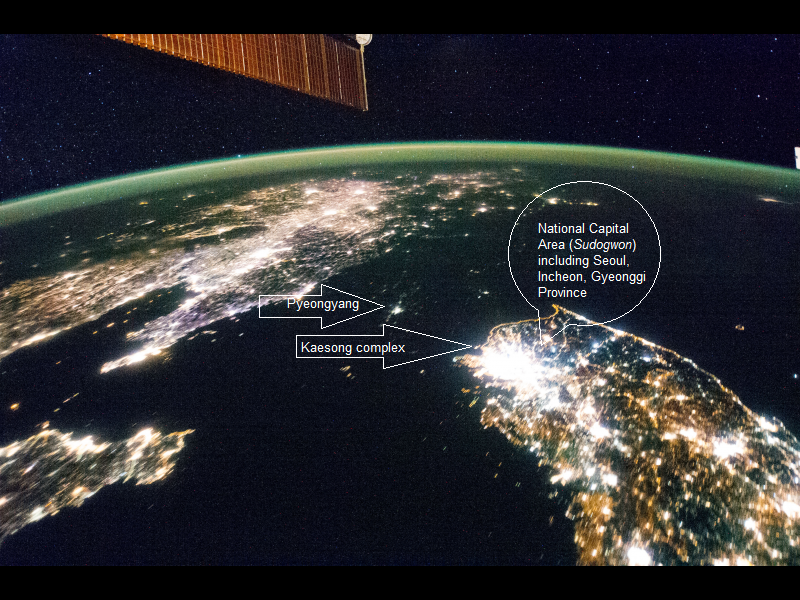 As noted by NASA, the capital of North Korea, Pyongyang, shows up as comparable to a smaller South Korean city. Also, the dot clearly visible just north of Seoul is the Kaesong industrial complex jointly operated by North and South Korea which was located there because of its proximity to the large new seaport/teleport/airport in Incheon.